Facebook Live is known as the Periscope killer. But do you know what it can do for your business? I don’t care if you’re a software engineer, the owner of a manufacturing company or a serial entrepreneur, you need to be on Facebook live. There’s no ifs, ands, or buts about it. Have you taken a look at your Facebook news feed lately? You’ve probably scrolled by dozens and dozens of posts. Take a closer look. You will quickly come to find that nearly 80 percent of the posts you see are video. A year ago, Facebook revamped video. They stuck it at the forefront of their algorithms. And if you ask anyone, the test of time has proven that video performs far better than text, images, or even links. But why should you be on Facebook Live? Here’s an example of the results of a live video Dennis’s partner posted. 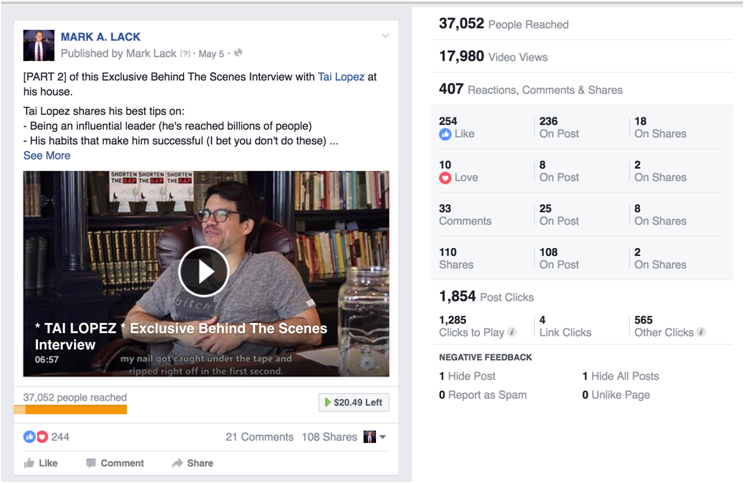 Mark Lack, whose ads account is managed by BlitzMetrics, recently posted a live video he shot with Tai Lopez. 13,995 already people who like Mark’s page, yet he was able to reach 37,052 people with live video. And half of those watched it! 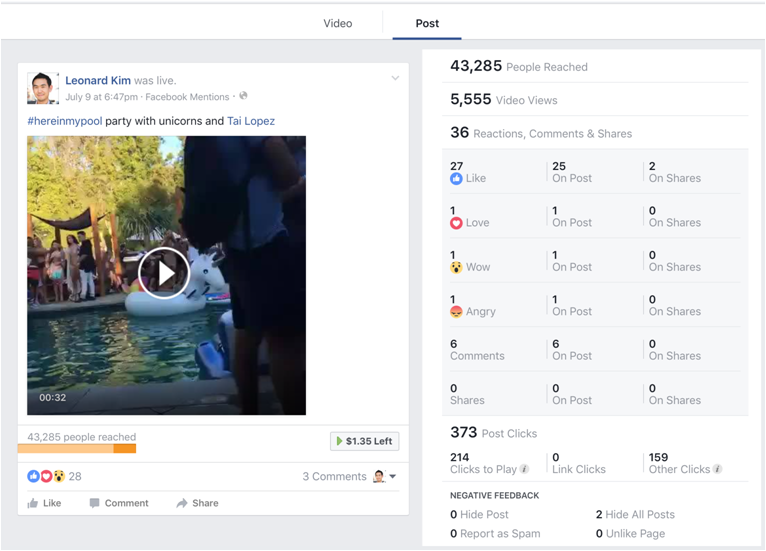 It’s rare to see any type of Facebook post get a bigger reach than how many likes a page has, but it happens in video. Mark’s wasn’t the only occasion. Leonard Kim, managing partner of InfluenceTree, teaches people how to build their personal brand, get featured in publications and growth hack their social media. He also works for the University of Southern California’s medical enterprise, Keck Medicine of USC. The technical team at his work helped him set up a Facebook Live video using a real camera (as opposed to a cell phone), with audio done through a computer system. 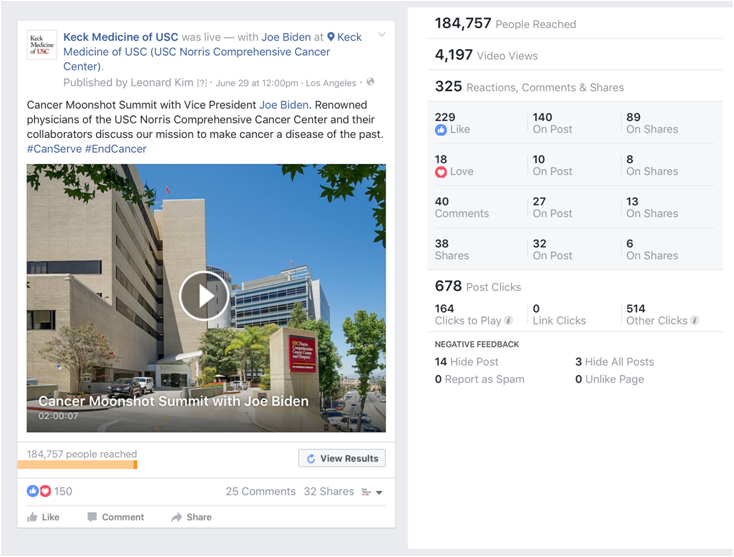 Leonard broadcasted a two-hour cancer moonshot summit and expected to get an organic reach of 10-20,000 people since only 6,000 liked the page. The video ended up getting an organic reach of 175,000 while the video was still live. Now it’s at 185,000. If Leonard had known the video would have reached that many people, he would have worked a bit harder on the headline. That’s 30 times higher than how many likes were on the page! Once he saw the results, Leonard went back in, edited the headline to the post and boosted to people in the target market to increase viewership. A bit skeptical, Leonard felt that the content only went viral due to Vice President Joe Biden’s backing of the Cancer Moonshot Summits. He decided to put up a 30 second Facebook Live video on his own page, which has 4,000 followers. This video was shaky, amateur and done after he had a few drinks at Tai Lopez’s house for an Influencer Party - only people with over 100,000 social media followers were invited. That post hit a reach of 43,285 people. That is 10x Leonard’s audience size. Facebook Live is a win for any business. You just have to cater your message to a specific audience that will resonate with the content. Then the organic reach you receive from Facebook will get your videos into the news feeds of the exact people you are looking to target. Then you can back your posts with a dollar a day strategy that will amplify your results. So even with a limited budget Facebook Live is powerful. After running two tests on Facebook live without the best content and with headliners that could be better, Leonard has started to work on creating his long-term video strategy. He is going to start filming videos where he teaches people how to build their social media pages and grow their personal brands. You can follow him on Facebook here. Do you know anyone who has tried Facebook Live? Have they been getting similar results? I’d love to hear more! Comment below.